A new shop specialising in sports nutrition has opened its doors in Preston. Met-Rx Preston has moved into a unit on the ground level of St George’s Shopping Centre in the city. The shop is managed by Jonny Regan and Lee Yates and is the first of its kind in the city. It sells vitamins, minerals, herbals and other speciality supplements, diet and energy products. The pair, who have more than eight years’ experience in the industry, believe the store is filling a gap in the market in Preston. The new store has created three full time and two part time positions and there could be further recruitment in the coming months. In a bid to stand out and appeal to shoppers a 60 second exercise challenge is held in its mini gym each week. The aim of the game is to complete as many of the weekly challenge exercises as possible in a minute. There’s an eight week cycle and the moves include press ups, squats, bicep curls and push ups. Everybody who participates will see their name and result on a leader board and then at the end of the week, when the battle of the fittest is over, the winner will be rewarded with a £50 voucher to spend in store. And, it has already proved to be a hit with more than 40 shoppers taking part in the past four weeks. General manager at St George’s Shopping Centre, Andrew Stringer added: “It’s fantastic to see such a fresh-thinking brand commit to the city. It offers something slightly different to what we’ve had before. 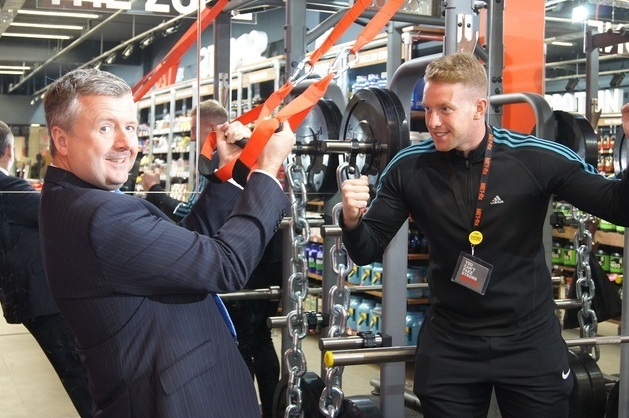 Health and fitness is hugely important to so many people and this store can really cater to their needs. The weekly challenges in Met-Rx start on a Saturday and winners are announced on a Friday. Met-Rx is part of health food group NBTY Europe, which also runs Holland and Barrett and GNC stores.